At the start of a business, manual document filing can be quick easy and necessary. However, as your business grows manual filing can become a very cumbersome practice. 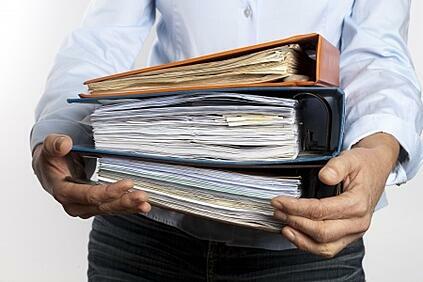 In a busy business world it is important that you can file, find, and store documents in a quick and effective way. There are more efficient ways in today’s growing technological world that can help keep your organized with a higher productivity level. Here are some disadvantages of manual document filing processes. The biggest downfall to manual document filing is the amount of space it can take up. While at first your business will be small enough that it’s not a huge deal, once you start growing you are going to want to find a new way to store files. Otherwise you might find yourself taking up rooms just to fit the files in. This also means you have to go out of your way to hunt down a file or a client. This is just one big headache you don’t need. It interrupts your productivity levels. Manual document filing means you are placing faith in the people handling the files. There are so many ways they can be damaged, lost, or misplaced. A fire or natural disaster could mean the loss of all your clients’ important information. You will have to start over at square one getting the information back. It can also lead you to losing clients who don’t appreciate your mishandling of their information. When you are working with paper documents it is much harder to make changes. Every time you want to make a change you will have to make a copy, so you don’t destroy the original with any edits or comments you might add. This means the editing process is more time consuming than if you were working with digital copies. Manual document filing is very time consuming. Not only do you have to organize and store the files, hunting down the information when it is need can take time. It can take anywhere from minutes to hours to hunt down a file, depending on how well your organization is. This can cause annoyance for clients as well as for employees. Their productivity is lowered by having to spend excessive time dealing with a paper filing system. Paper document filing can be less secure than electronic filing systems. Misplaced documents can easily be placed in the wrong hands. Clients expect their information to be secure in your hands. If you can’t keep this safe, you are at risk for losing them. A cabinet filled with files is way easier to access than a computer which requires a password and credentials to get into. When you use paper documents your costs are going to be higher because you are paying for ink and paper. Your office supply bill will be higher if you are using a manual document filing process. While you might think this is insignificant, overtime it’s a lot of money that can be used in better ways. While manual document filing can be useful for smaller businesses, once your business has grown it can be detrimental to your growth. It can lower productivity and create a hassle for your employees and your clients. Not only are your documents at risk for harm, but they have the potential to be lost and damage in a natural disaster. All your paper files are doing is taking up valuable space as well as time.